The Expert Advisor is based on the strategy which involves only one deal per a day. The deal is made according to an analysis of a market movement for the previous day which is performed by an indicator integrated into the EA. 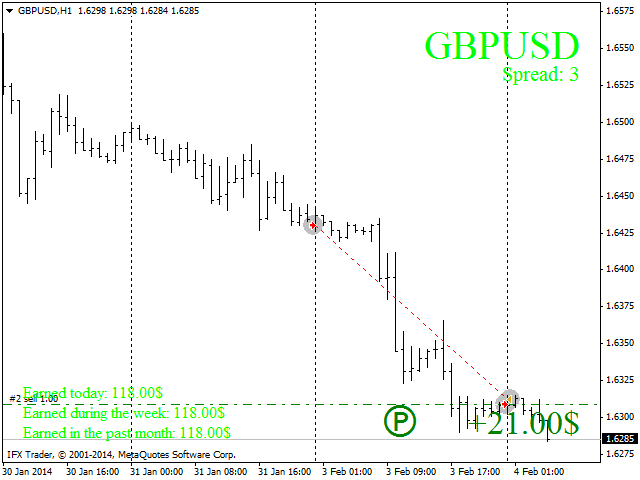 The robot enters the market at 00.00 following the trend or in the counter-trend direction (depending on settings). The main requirement for the EA's operation: it has to be running every day for a few minutes within the period from 0.00 to 1.00. The robot works during this period only, afterwards it is disabled and awaits for the same period of the next day. So there is no sense in having the robot enabled during the rest of the day! The robot does not need VPS servers! Just enable it for a few minutes every day within the period from 00.00 to 01.00. The price of the EA will be going up as sales increase. Lot = 0.01; // Lot of the first order. Risk = 0; // Risks. A smaller value means a higher risk (if set to 0, the lot is taken from the option above). Trend = true; // Follow the trend or the counter-trend direction. K = 2; // The value the next lot should be multiplied by. Step = 20; // The minimum step to place the next generation (the deal will not be placed if the step is not passed). ExpertID = 546847; // The magic number for multi-currency trade. Information = true; // Show info. Color = Lime; // Info color. ATTENTION! Before buying a robot, try out the demo version. Buy it only if you are completely satisfied with the demo version! I would like to thank everyone who bought this EA and I wish you happy trading! Great stratedgy. works well as described. I have a few of Aleh's products they are the best in the market. If we could alter the deal time slightly to avoid high spread at the current settings i would change to 5 stars, Waiting for a possible update to include this feature but apart from that, very good!